The Niners fell to the Green Bay Packers, what would be the final loss of the season for the Niners, as Don Majkowski ran in two touchdowns and threw a third, overcoming 325 yards by Joe Montana, who was sacked five times. ↑ "1989 NFL Pro Bowlers". Pro-Football-Reference.com. ↑ "1989 NFL All-Pros". Pro-Football-Reference.com. ↑ San Francisco 49ers 2015 Media Guide. 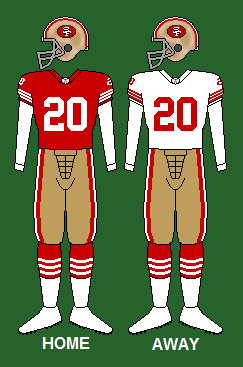 San Francisco 49ers. p. 562. ↑ "1989 San Francisco 49ers starters and roster". Pro-Football-Reference.com. Retrieved March 1, 2015. ↑ Game originally scheduled to be played at Candlestick Park, but was moved to New Orleans due to the San Francisco Giants postseason game. The November 6 game was moved to San Francisco. ↑ Game played at Stanford Stadium due to damage to Candlestick Park resulting from the Loma Prieta earthquake. 1 2 3 4 5 6 7 8 9 10 11 12 13 14 15 16 17 18 19 San Francisco 49ers 2015 Media Guide. San Francisco 49ers. p. 456. ↑ San Francisco 49ers 2015 Media Guide. San Francisco 49ers. p. 517. ↑ "Archived copy". Archived from the original on 2009-06-19. Retrieved 2012-08-03.